My little girl is going into her third month of Pre-K, and she's having soooo much fun. I think I was more excited than her when she brought home her first Scholastic Book order form. I let her pick out two books, and her first choice was National Geographic Little Kids First Big Book of Animals. Since it arrived a few weeks ago, we've read it cover to cover at least three times. She also used it as last week's book report in Tae Kwon Do. 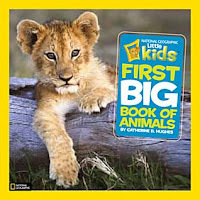 Because it's a NatGeo book, there is naturally amazing photography of all types of animals, but what makes the book stand out is its child-friendly format and content. I've seen TONS of non-fiction for kids that is packed with big words and tons of details, but this one presents information in easily digestible chunks and the author chose facts that seem to be naturally interesting for young children. The book is organized into different habitats with spreads of the types of animals that live in those habitats. The book is oversized (10x10), so there is plenty of real estate for fun facts. Each spread contains a call-out box with quick facts such where the animal is from, what it eats, and how many babies it normally has at once. The pictures also have captions and call-outs with fun facts. There are also typically a couple of paragraphs that provide more detail. I tend to prefer non-fiction that tells more of a story or narrative, but this is a great choice for a quick reference. I can see it being used across the curriculum for language arts, geography, and science. This would even be good in math and technology classes. "I like this book because it has a red-eye tree frog. The red-eye tree frog has red eyes all of the time, but that doesn't mean he's sad. It lays its eggs on a leaf, and they look like fish when they hatch. And I like all of the pictures, especially the one of the giraffe drinking water. Next time I go to a pond, I'm going to try to drink like that if the water isn't green." Sometimes I'll see a picture book, and without even opening it, will know that I'll love it. That's what happened with Eric Rohmann's Bone Dog. The cover shows a boy in a skeleton costume with his arm around a skeleton dog. They are sitting on the grass, their backs toward the reader, the skeleton dog wagging his bony tail. Something about that tender moment between a boy and his dog tugged at my heart a bit, and of course, the idea of a boy and a bone dog was intriguing. I'm a fan of Eric Rohmann. I think he's a fantastic storyteller and artist, so I had high expectations for the book. I was surprised when the story exceeded my expectations. I absolutely loved it. The plot begins with Ella (a furry brown dog) and Gus (the young boy on the counter) playing. One night, under a full moon, Ella tells Gus that she's old and won't be around much longer but promises that she will always be with him (pretty sad, huh?) Then she seals the deal by saying, "A promise under a full moon cannot be broken." Then the story cuts to a time when Ella is no longer around, and Gus seems to be moving through the motions of life and forcing himself to do things like leaving the house and doing chores even though he doesn't really want to. On Halloween, he doesn't even want to go trick or treating, but he pulls on his skeleton costume and goes anyway. On his way home from trick or treating, Gus meets up with some spooky skeletons in a graveyard, and Ella's fulfills her promise and comes to Gus's rescue. This book is bittersweet, a bit spooky, and funny all at the same time. And the illustrations are superb and full of emotion. 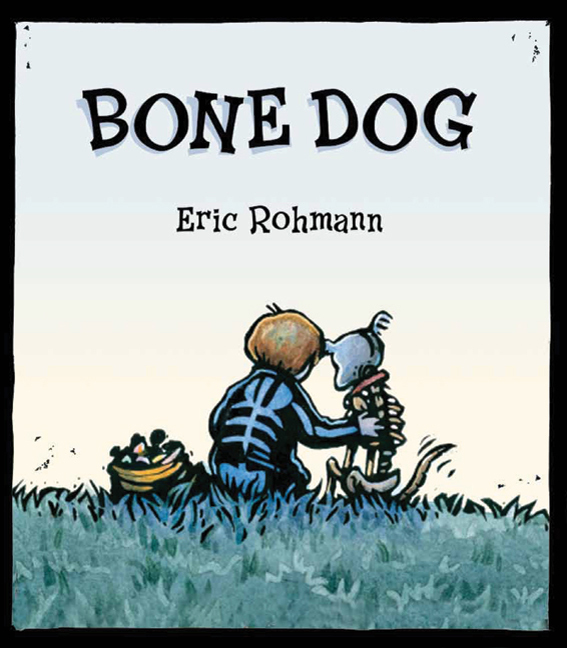 But above all, in just a few pages, Eric Rohmann is able to capture the love between a boy and a dog and tell an exciting story. It's not often that I experience such a range of emotion in a children's book. Highly recommended. I nominated this book for the picture book category for the 2011 Cybils. Head on over and vote for your favorite children's and YA books published between October 16, 2010 and October 15, 2011. Nominations close at midnight (Pacific time) on October 15, 2011.